Interesting. They understand a bit, yet aren’t very sure of what they know. Seems like the perfect time to offer a challenge. 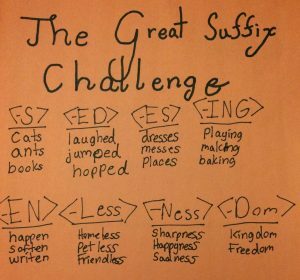 A suffix challenge. The students are placed in small groups of 2-3. Their task is to list a suffix and think of three words that have that suffix. 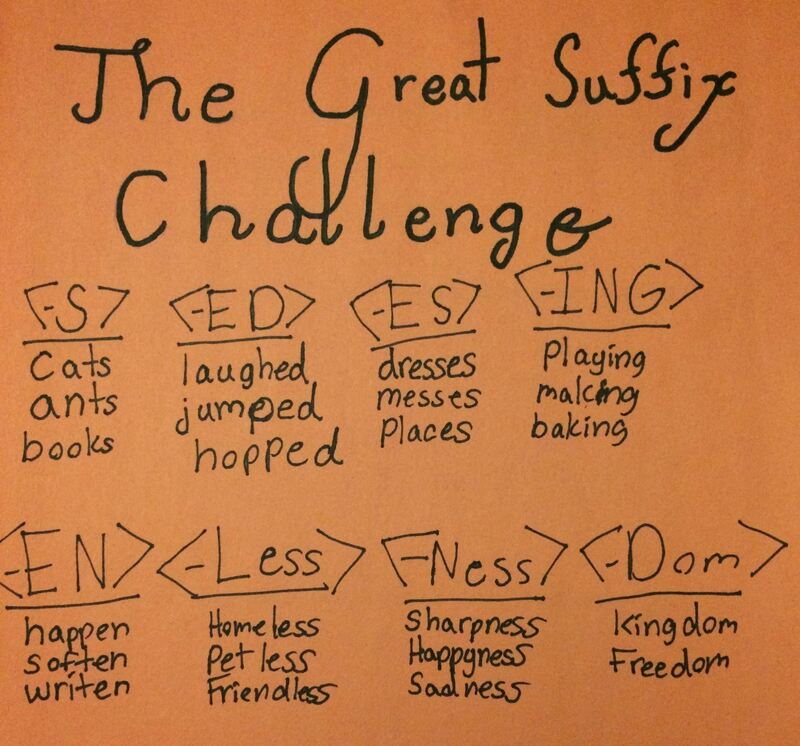 The goal is to list as many suffixes as they can in the time given, each with three example words. As part of introducing this activity, I use the following example on the board. Usually someone notices that in the word ‘dress’, the final <s> is really part of the spelling of the word. It is not a suffix. Perfect. So as they begin this task, they are keeping in mind the difference between the final <s> in dress and the final <s> in pencils. They recognize that while ‘dolls’ and ‘pencils’ are good examples of an <-s> suffix, ‘dress’ is not. 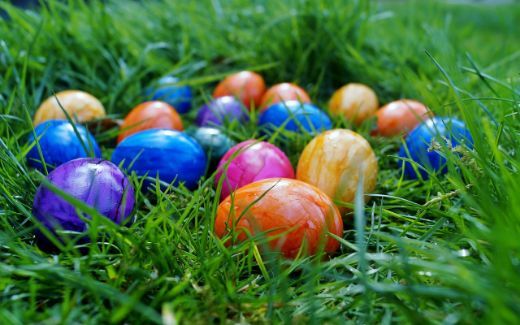 They are ready to begin. When they ask where they will find these suffixes, I suggest they pull a book off the shelf. It doesn’t have to be any specific book, just a book with words. As they skim the text, looking at the words, they will recognize a word with a suffix. And that is what happens. After 20 minutes, we stop for the day. The next day, they have 30 minutes. Part of what they are to do this day is to print the information they have gathered on a piece of construction paper so that others may easily read it. Then I collect the sheets. 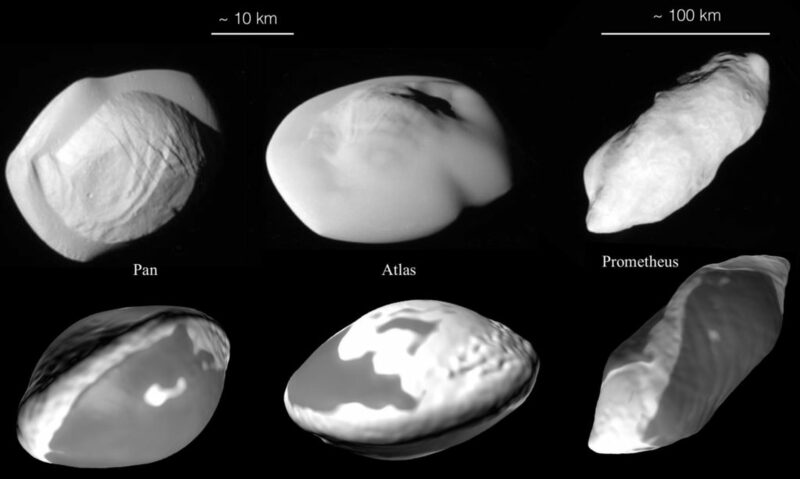 Here are some examples of how they looked. On the third day, I handed these sheets out, making sure that they didn’t go to the group that created them. I also handed out a recording sheet. They were to record the suffixes they felt were proven, and those they questioned. They were also to list words that didn’t seem to have the suffix that was listed. Here is an example of the recording sheet. As the groups looked over the lists of suffixes, I circulated with my camera, catching the conversations within the groups. Here’s a snippet of what I heard. I really enjoy this activity. I love hearing the students share their thoughts with their group members. I become so aware of what they do and don’t understand about suffixes and the suffixing conventions. 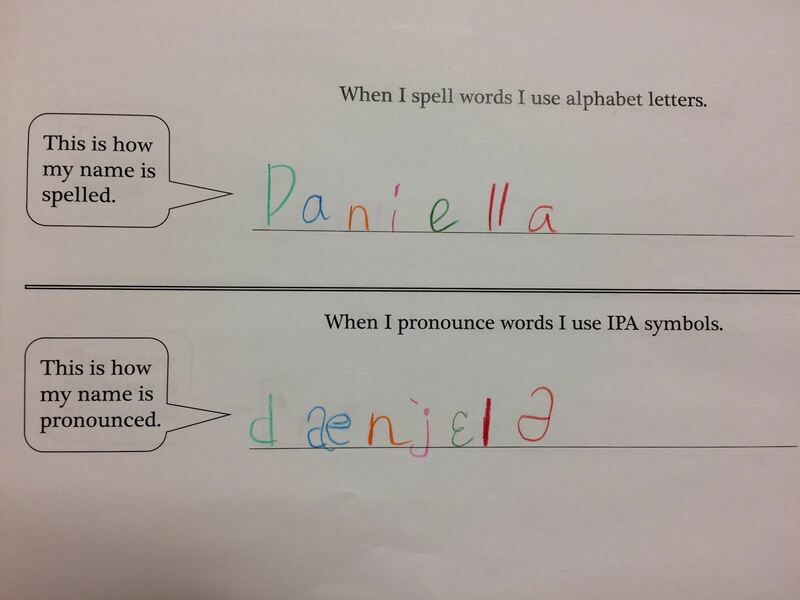 I get a sense of which students have no understanding of a suffix. These are the students who list one or two of the last letters of a word and call it a suffix. 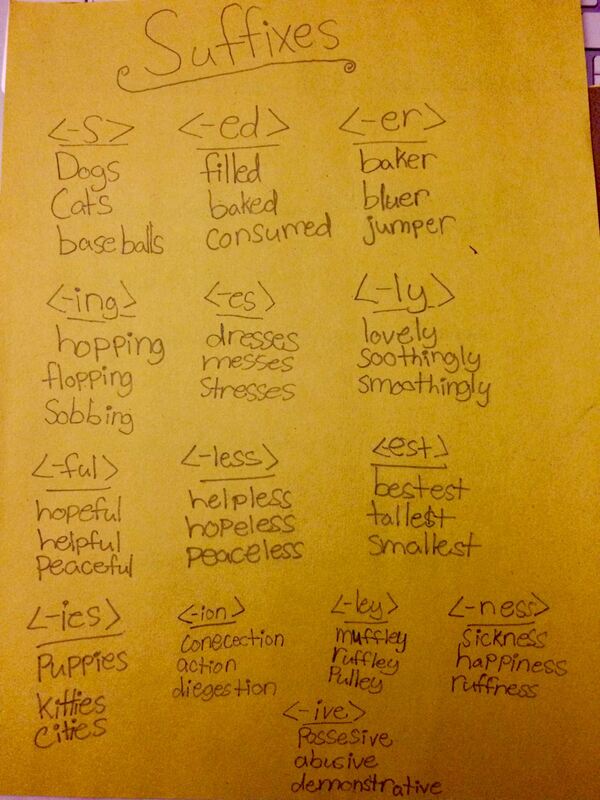 I also get a sense of which students recognize suffixes in their reading and can easily list fifteen or more. It’s a great beginning of the year assessment piece. I will do this again mid year and see how understandings are progressing! 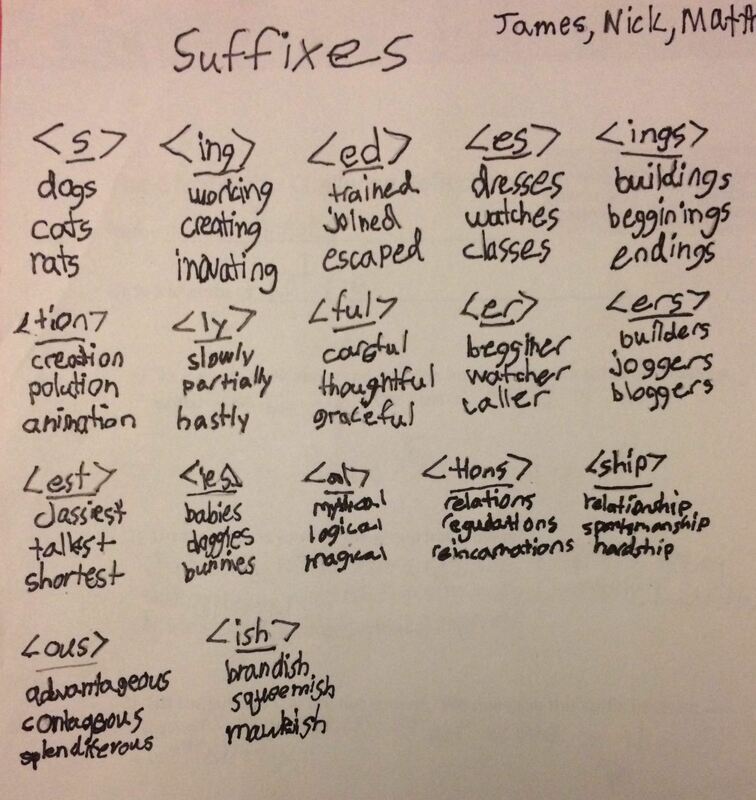 As a follow up, I asked students to tell me about suffixes they questioned. I wrote them on the board. 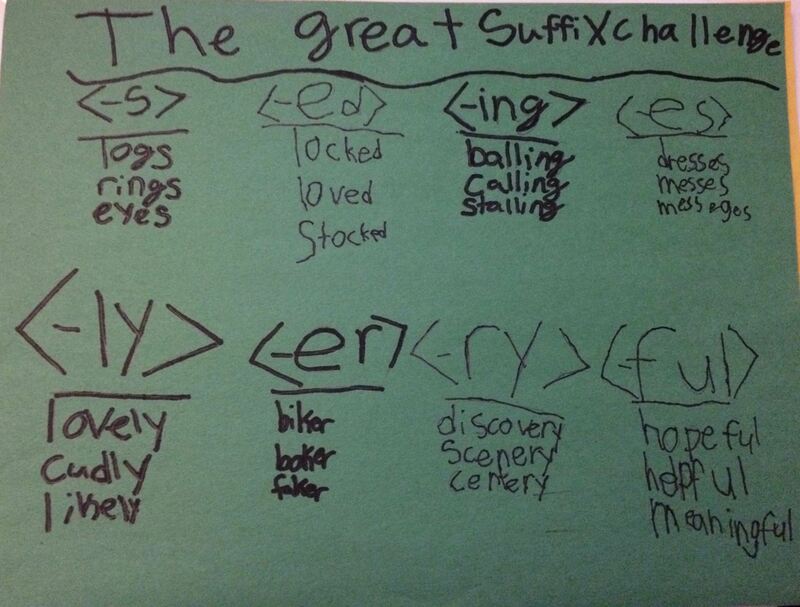 We talked about the example words given and decided whether or not we felt the suffix had been proven in those words. These discussions took off in the directions they needed to. We talked about replacing the final <e> when adding a vowel suffix, but also having that <e> become visible once more should the vowel suffix be removed. 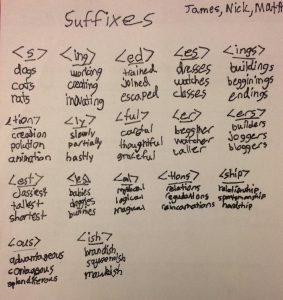 We talked about suffixal constructions – meaning the joining of two or more suffixes. 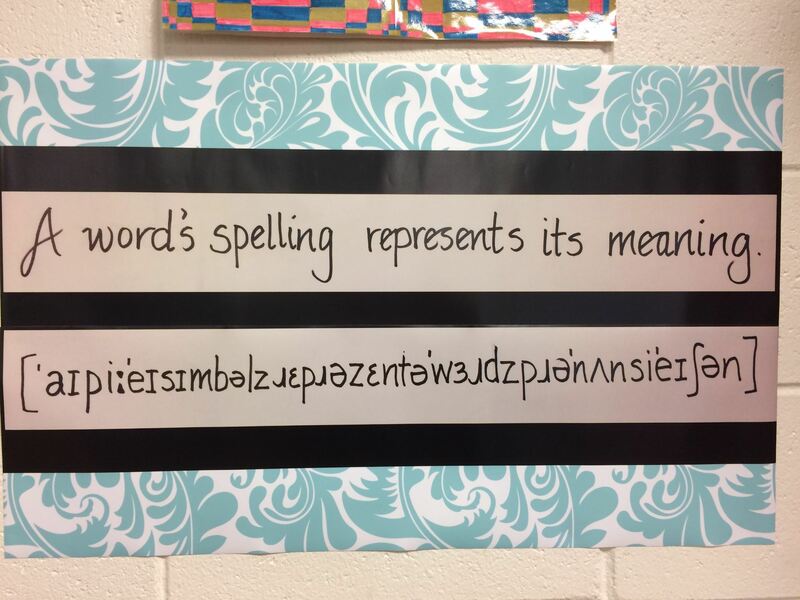 I could tell that this idea – that words have structure – was beginning to take hold in many of the students’ minds. 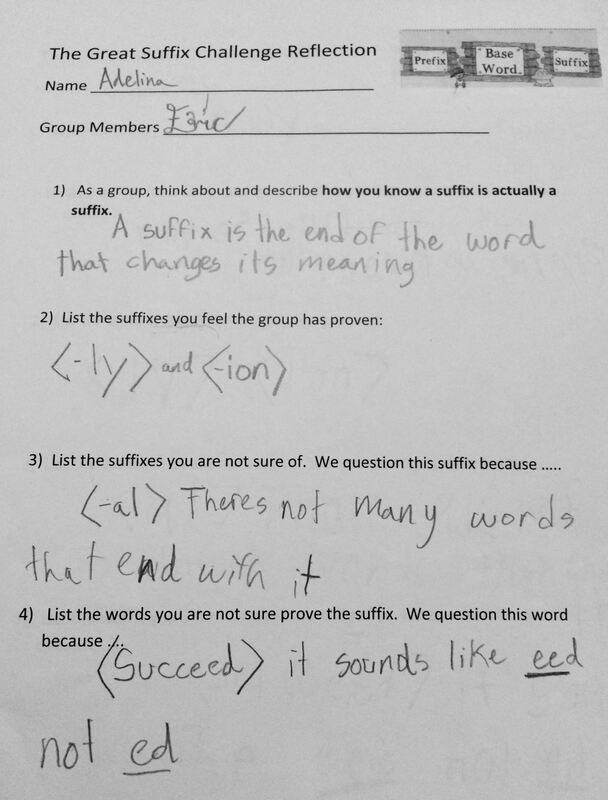 We began the next class with some history of the word ‘suffix’. First attested in 1778, it is from Modern Latin suffixum “fasten, fixed on”, from <-sub> “under, up from under” + <figere> “fasten, fix”. So a suffix is fastened to something. Sometimes it is fastened to the base element itself, and sometimes it is fastened to another suffix. It is also interesting to note that the <suf-> prefix is an assimilated form of <sub->. 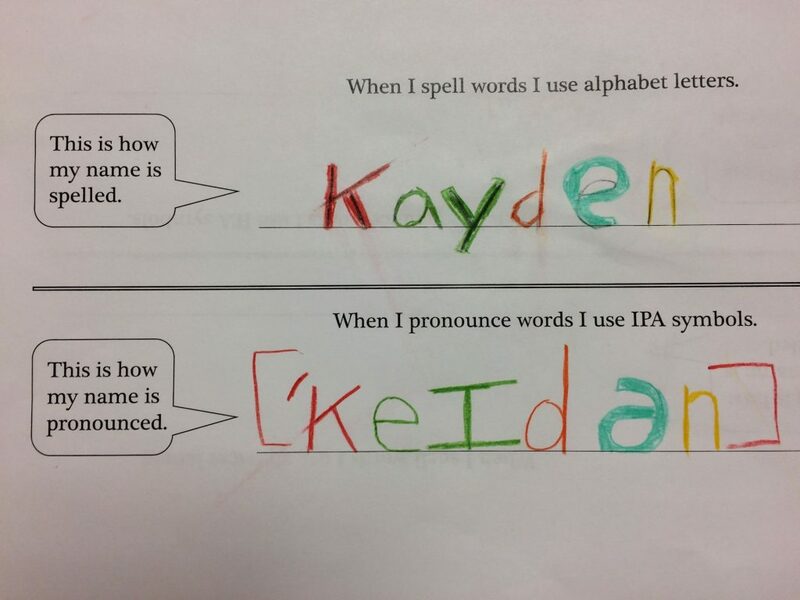 They are the same suffix, but with alternate spellings. “Why was another spelling needed?” I wondered aloud to my class. “Let’s try this to see if we can understand why another spelling was needed. Everyone pronounce the word as if the <sub-> prefix was used instead of <suf->.” When everyone had said the word ‘subfix’ at least twice, I asked everyone to repeat it about five times in a row. Then I asked if anyone noticed a change taking place. Now it was time to watch a video made by my students a few years ago. It is called Can You Prove It? It is a game show in which the two contestants are given words. They have to decide what the suffix is and to provide evidence to support their choice. 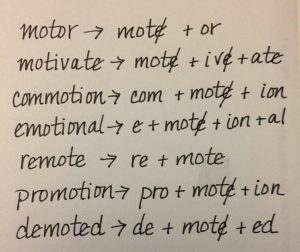 Following the video, I wrote the word ‘motion’ on the board along with its word sum. I know that this idea of a bound base is extremely new, so I wanted to show them how common this one in particular is. I wrote <motion –> mote + ion>. Then I asked if anyone knew why I put the <e> after the <t>. 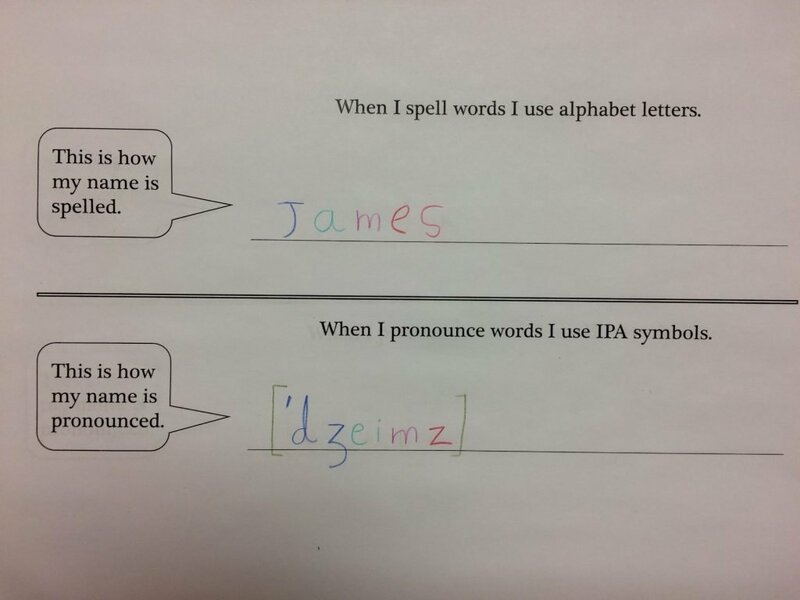 One student thought it was marking the pronunciation of the <o>. “Great! It is! But there is another reason, as well!” No one had any ideas, so I wrote the word sum without the <e>. Beneath it I wrote the word sum for ‘hop’. I pointed out the similarity between these two morphemes. They each had a final consonant which was preceded by a single vowel. 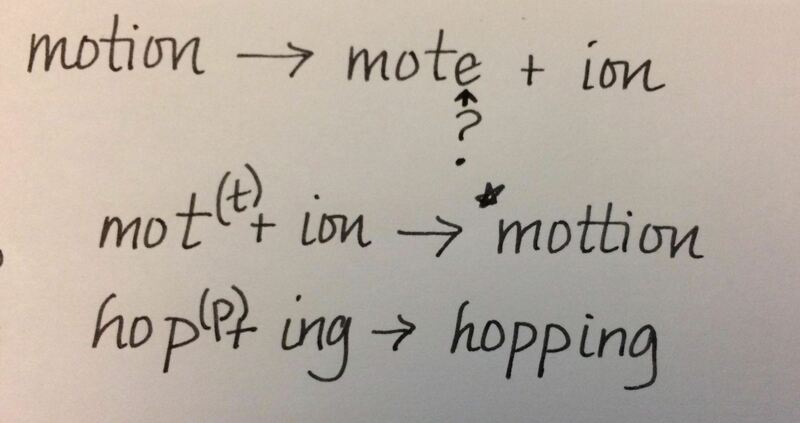 When I asked what the final spelling for <hop + ing> would be, they knew the <p> would be doubled. I was trying to draw a parallel and to show that adding a vowel suffix to *<mot> would force the same kind of doubling. And we all knew that the word ‘motion’ had only one <t>. 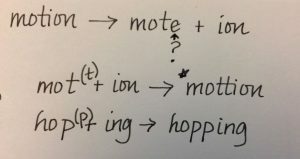 So, to prevent the <t> from being doubled, there needed to be a final <e> on the bound base <mote>. I also showed them that when we added a vowel suffix to ‘hope’, the <e> prevented the <p> from doubling. As I wrote these on the board and we talked about what happened at the joins (the place where the morphemes joined), I could feel the understanding taking root. All words have a structure. That structure includes a base element which carries the main meaning in the word. If the base element can be a word on its own, it’s called a free base. If it must be fixed to a suffix or a prefix in order to be in a word (like <mote>), it’s called a bound base. 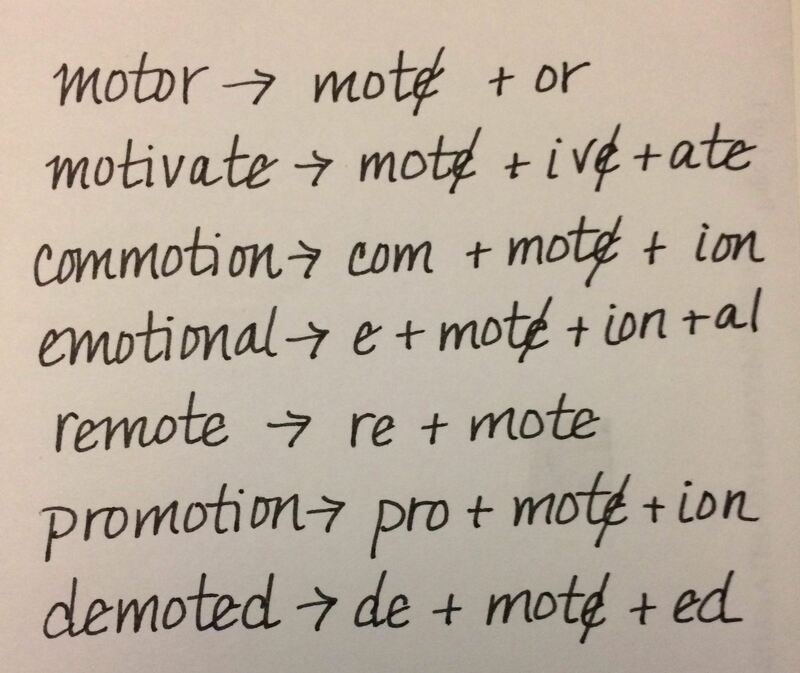 When a vowel suffix is joined to a morpheme (a base or suffix) with a final non-syllabic <e>, that <e> is replaced. When the suffix is removed again, the <e> surfaces again. At this point, I asked the students to tell me the word sum for ‘motivation’. I wanted to see if what we were talking about was making sense to them. Confidently, they directed me to write the word sum and then, before I wrote the complete word, we went back to check those joins. As is usual when collecting words related to the base in this way, I asked how each of the words had that sense of “movement” that is inherent in the base <mote>. Students recognized that when motivated, they were moved to do something. When emotional, their feelings moved from the inside to the outside and showed up in a physical way (tears, smiles, frowns, etc.). With the tv remote, they knew that waves were moving between the remote and the television. When I asked what it means if you get a promotion in your job, one young man said, “Well, say you are sitting at your desk and typing away at your computer, and you get the news that you are going to be a manager instead. OFFICE PARTY!” We all laughed. This boy’s delivery was exuberant and funny. So then I asked if anyone knew what it means if you get demoted in your job. Another young man on the other side of the room raised his hand. “It means you move down in your job. It means you go home and sit on the couch and eat a cheesecake by yourself.” This time I was the only one laughing. The rest of the boys and girls were a bit confused, thinking that the cheesecake would be a reward, but I understood exactly the picture he was painting. I just wondered how HE knew what some people do to deal with bad news! So we are building understanding. Having a classroom of 23, I recognize that we’re never all on the same page at the same time. But we have all stepped away from the starting line. I love guiding them as I have this week, revealing bit by bit what has always been there, and then watching them make sense of what has never made sense before. Some think of a suffix as something that comes at the end. But for us, it has come at the beginning (of our year, of our journey, of our understanding). A language arts teacher (Cristi Julsrud) made a promise that she would challenge herself this year. The challenge she chose was to take an art class. Cristi enjoyed the experience immensely, but walked away with more than sketches and paintings. She walked away as a more reflective teacher. You see, throughout the experience, she couldn’t help but notice what a masterful teacher her art instructor was. Away from the art room, Cristi Julsrud was able to think about what made this art teacher so wonderful. She made a list of ten things that she felt made the art classroom a place where an individual’s learning was truly valued. You can read her full blog post here. While I agree with all of the points she made, five of them really struck a chord with what I do in my classroom while incorporating Structured Word Inquiry (SWI) and other orthographic truths. It’s unreasonable to expect everyone to be in the same place, at the same time, working on the same thing. I often have students working at different points in an investigation then their classmates. If a group or an individual finishes before others in the class, there is always another investigation to begin. The very nature of an investigation is such that I can’t predict what will be found. Sometimes an investigation can take several class periods. Other times it takes less. Pair that up with the drive and abilities of the students, and it becomes impossible to have everyone start and finish at the same time. When looking for a next investigation, I might suggest comparing words that have a final <ck> to those with a final <k> (or final <dge> to <ge>, or final <tch> to final <ch>). I might suggest looking at a word off the Wonder Wall in our room and seeing what they can find out about it. I might suggest a particular diminutive suffix (or frequentative suffix) to investigate. I might ask them to choose a word from our current science topic or from their current reading book. Quite often they suggest what their next investigation will be! The really important thing is to make time to present these investigations to the class. The group presents, and the rest of the class asks questions or suggests things that might be added. These reflective discussions of the investigations are where so much of the learning takes place! It is where we build a community of learners. Students become comfortable asking questions of one another. It is not about being right or being wrong. It is about building an understanding together. We don’t have to “fix” every problem. For me, this point addresses the fact that when we as teachers know a deeper analysis of a word, sometimes it is better to hold back on our own contribution to the investigation. Instead, we should guide the students to recognize the connections and logic of what they see on their own. Too often students get handed all the pieces and are expected to simply arrange the information or memorize it. The engaging factor with SWI is that the students learn how to dig for the information they need in order to prove their hypotheses about words. They learn to gauge whether or not what they found does that, and in doing so learn to see the sense and logic in our language for themselves. Here is one example of how I have guided a student who was trying to prove whether or not <tion> was a suffix. Look to masters to get started. In her post, Cristi is referring to the mentors, the experts, and the craftsmen who create art. 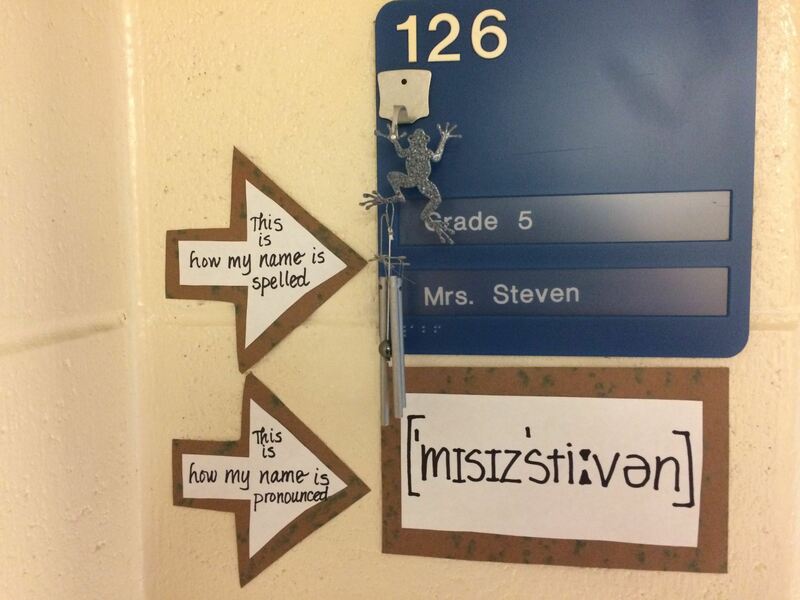 In the SWI community, there are many teachers to look to who are already integrating SWI in their classrooms. Many of them have blogs and can be viewed as mentors. I encourage teachers wondering where to start, to read the blogs and watch the videos of students engaging in SWI. Beyond the Word This is Lyn Anderson’s blog. She works with very young children. She has posts dating back to 2012. Small Humans Think Big This is Skot Caldwell’s blog. At the time this blog was active, Skot was teaching Grade 1 and thinking through the idea of word walls and the understandings even children this young are ready for. Rebecca Loveless Rebecca is a Structured Word Inquiry Coach who works with children, teachers and tutors. 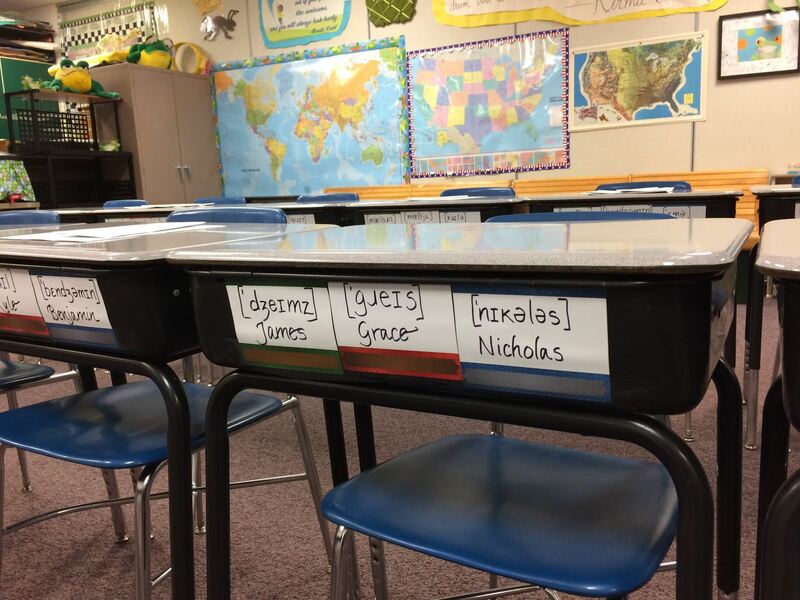 Mrs. Barnett’s Buzzing Blog Lisa Barnett is a special education teacher working with K-5 children in a resource room. Mrs. Steven’s Classroom Blog That’s me, and you’re already there. Posts back to 2012. Grade 5 Mr. Allen Dan Allen has posts pertaining to SWI from August 2011 through October 2015. 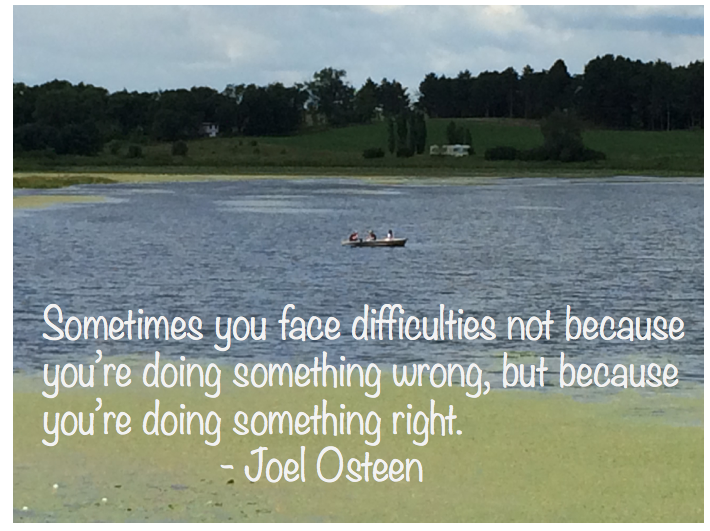 His posts were my original inspiration for learning more about SWI! Who in the World Skot Caldwell is now teaching Grade 5/6 and shares activities as well as how he teaches a scientific attitude. We often trade ideas! Word Nerds Ann Whiting taught 7th grade Humanities class. This has posts from 2012-2013. 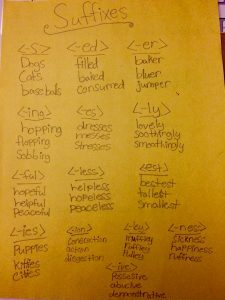 Word Nerdery is Ann’s second blog with 7th grader students. This has posts from 2013-2017. 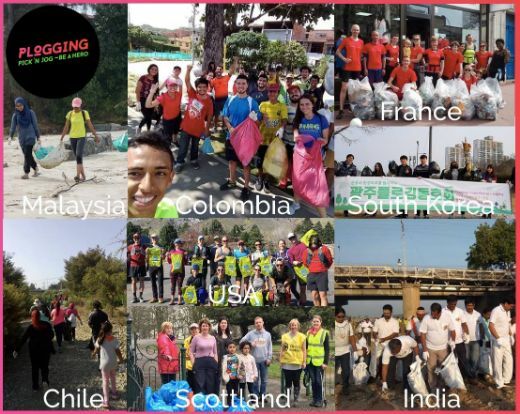 I have adapted many of Ann’s activities and learned much by reading Ann’s blog! WordWorks Literacy Centre Although this is not a teacher blog, there are many videos here of students working with SWI that I highly recommend watching! Pete Bowers began as a classroom teacher, and as he began his graduate work, focused on the scientific framework and 4 questions that are now known as Structured Word Inquiry. Take your time and look at many of these. Do not limit yourself to the age of the students you work with. You may find a great idea that just needs to be adapted in order to work for your students. Looking at many of these will also demonstrate the value of using SWI in your classroom. The videos contained in these blogs cannot be unseen. After watching them it will be hard to believe that teaching endless sorting or rote memorization is better. Choose an activity or investigation that fits your situation and try it. How did it go? What do your students need to understand next? Go back and read some more. Email the teachers you are following to ask your questions. Post your questions or share your experiences on the recently formed Facebook Group called Structured Word Inquiry in the Classroom. There are many in that group who have experience using SWI with children. This is a community of learners and we all benefit from questions asked. The scientific framework of SWI empowers the students. They have a routine to follow that will lead to the evidence they are seeking. They will know what to do when the evidence they find proves their hypothesis, but also what to do when it doesn’t. Because of it, they can become independent learners. They will, through practice, be able to provide evidence to support their thinking no matter what subject they are studying. This is a model for scholarship, and you will find your students are hungry for it! By the end of the year, my students have stopped asking, “What did I get on that?” They don’t need a grade to tell them they learned something. It is so obvious to them. The grade is not the final step for them. It is not the finish line or the reward. The middle of an investigation, that is what they enjoy. The finding out what no one else in the room knows and being able to help everyone understand what they have found out – THAT is the reward and the joy and the goal. Home and Homely – What is the Connection? 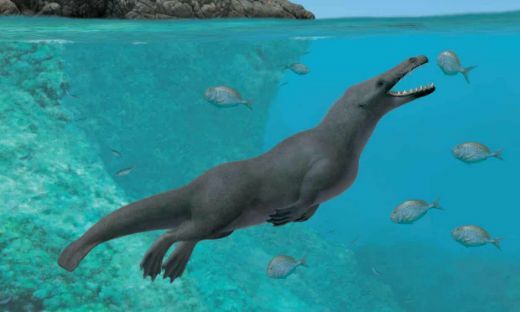 We had a lovely first dip into Etymonline today. It wasn’t planned, but if you encourage question-asking, it’s just the sort of thing that is bound to happen. We were talking about suffixes. 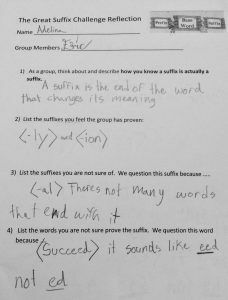 One group of students had identified <-ly> as a suffix and had given the words lovely, bravely, and homely as evidence that it was indeed a suffix. A second group who was asked to carefully consider the evidence offered by the first group was wondering about the word <homely>. They had never heard of it, and they couldn’t determine whether or not it had a suffix until they knew the word. Bravo, right? After thanking the second group for their brilliant question, I brought the word <homely> to the attention of the entire class. I waited a bit and gauged by their faces that they were out of ideas. I must say that I was surprised that no one had heard of this word. Our next course of action was to go to Etymonline and find out the story of homely. Was it related to home, homebody, and homey? None of us knew the answer to that one. Here’s what we found. The word <homely> was first attested in the late 14th century. That means that there is written evidence of the word existing then. There is no written evidence from dates earlier than that. At that time, the word was used to mean, “of or belonging to home or household, domestic”. In Middle English it was spelled hom and had the same sense of “home”. Since, at that time, most homes were not fancy, it also took on the sense of “plain, unadorned, simple”, which extended into “having a plain appearance, without particular beauty of features, crude”. That last sense has survived in the United States where it was the usual term for “physically unattractive” and referred to things other than homes, including people. At this point the students let out a surprised, kind-of-unbelieving laugh. How unexpected! So a person is called homely with the idea of a plain unadorned home in mind. Huh! We kept reading. Such a person was also said to be ill-tempered. We decided that we would not want to be referred to as homely. It was not a very positive view of another person. It was particularly interesting to note that while this word continues to have this sense of physically unattractive in American English, it never did in British English. In British English it has always referred to the home, with a sense of a simple, yet comfortable and cozy place. We also read that the words homelike (1789) and homish (1560’s) referred back to the domestic sense of the word. Another word in this family that sounded rather odd to our ears was homelily. 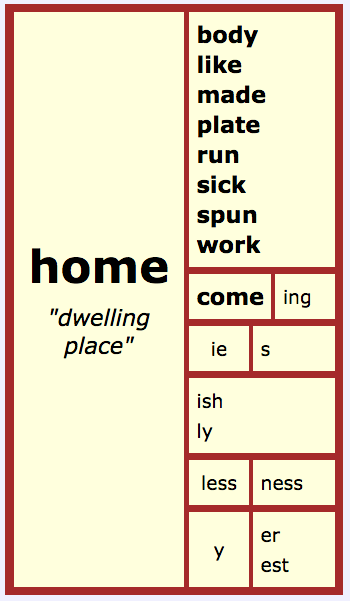 It’s an adverb, first used in the late 15 c., and its structure is <home+ly+ly –> homelily>. Did you see what happened there? The <y> of the <-ly> suffix of <homely>, toggled to an <i> before the final <-ly> suffix was added. We had to think through this carefully before pronouncing it. We thought of happily, sleepily, lazily and imitated the stress patterns in those words. We checked to see if it could be found in current dictionaries, and sure enough, it was there. homey (adjective, meaning pleasantly comfortable and cozy) *** We checked with our Oxford American Dictionary to understand why the <-y> suffix wasn’t replacing the final non-syllabic <e> in this word. We found out that homey and homy are both accepted spellings. As usual, the longer we thought about it, the more words we could think of. We drew a matrix on the board and added words as they were suggested. It got a bit congested and messy. Here is a version I created at Mini Matrix Maker. Tomorrow I intend to share this entire inquiry with my other two groups of 5th graders! Homey or homely? 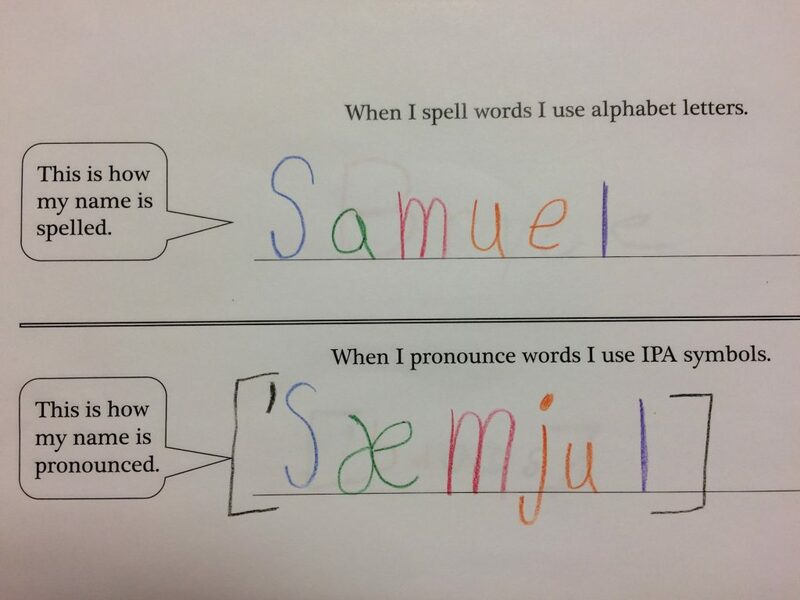 When you begin to learn what is real about English spelling, you begin also to swim upstream in an educational world that has been led to believe that reading begins with phonics. Those in the front lines (tutors and teachers of kindergarten, 1st grade, and 2nd grade) who have received intense training in this phonics-first model, seem to struggle the most in imagining a world that begins with meaning and then considers morphology, etymology, and phonology as interrelated in explaining a word’s spelling. 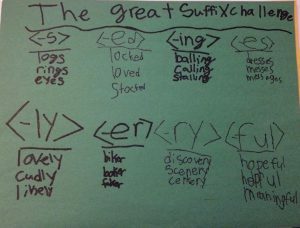 When first hearing about Structured Word Inquiry, educators who have seen the gamut of “spelling programs extraordinaire” wonder if SWI is just the latest thing that doesn’t fulfill what it promises. And often when they realize it is NOT a program and doesn’t have a teacher manual with all the answers in it, many feel like they don’t have the time to be interested. Such a shame. The fact that it is NOT a program is its strength. The fact that there is no teacher manual with answers, drives home the point that with Structured Word Inquiry, answers are not what is being sought. Ponder that a moment. With Structured Word Inquiry, answers are not what is being sought. “So if my students and I investigate the <o> in <people>, and find out that it is an etymological marker indicating a relationship to <population>, isn’t that the same as finding an answer?” Fair question. In the last bunch of years, I have been trying to clear my classroom of the word answer and substitute it instead with the word understanding. You see, there are distinct implications with the use of these two. When a question is asked and an answer is stated, the discussion is often done. Everyone moves on to something else. When a question is asked and an understanding is reached, there is that same moment of satisfaction, but there is something more. 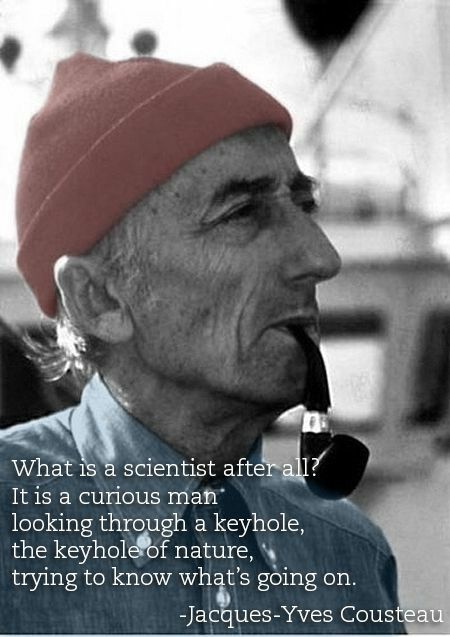 There is also the mindset that if, at some point, we uncover further evidence, we will reach a deeper understanding. We are open to it. We are not done. We are seeking to understand our language in much the same way a scientist seeks to understand our world. Until I began investigating words with students, I didn’t even realize the “must-have-all-the-answers” burden I was carrying. Once I set that burden down outside the door of my classroom, I was able to move forward as wide-eyed and curious as my students. We learned together. More words to ponder. Think of what it is like for students to move from classroom to classroom in which there is one expert and the students are all thought of as buckets to fill. With Structured Word Inquiry, the students are taught to find out for themselves the truths about our language. When they are given the structure and resources to figure things out for themselves, it can be exhilarating! They are tasting scholarship for the first time. So empowering! So what happens when I talk to my students about scientifically investigating words? Or when I tell them we will be studying spelling like a scientist would? ~~We propose a hypothesis about the word’s structure, trying to figure out the word’s base element. ~~We research the word, finding more about it’s history and the implications its story might have on its spelling. ~~We collect data (words related either morphologically or etymologically). ~~We pay attention to the phonological aspects of this word and what that means for its pronunciation. And when we have come to an understanding, when we have collected enough evidence to either prove or disprove our initial hypothesis, we share our findings with each other. We talk about what we found and engage one another in dialogue about the research or the related words. 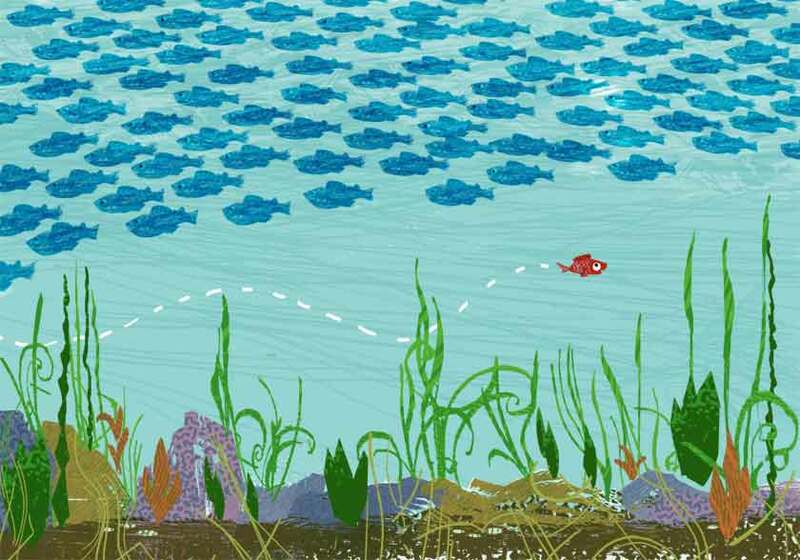 Swimming upstream in today’s educational current is challenging. But when you see the faces of your students as a spelling all of a sudden makes sense, when they come to your room before school starts to ask if pediatrician and pedestrian share the same base element, when they can’t wait to get started on an independent investigation, or when they begin to see morphemes in words where before they only saw letters, THAT is when you know the challenging swim is the right thing to do. And you do what you do and you share what you do, and you hope that one day the tide will change. Pun intended.